Hennig Gasket & Seals is a leading manufacturer of high quality Gylon Gaskets for a wide range of industries across the country. 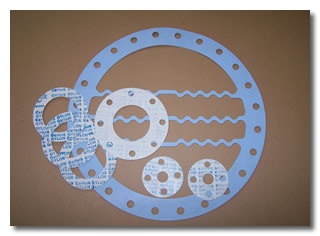 No matter if your project calls for a single prototype or large production runs; no matter if the gylon gasket is simple or complex, we are committed to our promise of providing our customers with non-metallic material that has been accurately cut to the tightest tolerance and delivered with the quickest turnaround in the industry. That has been our promise for over 90 years. Hennig Gasket & Seals will custom manufacture your gylon gasket from provided blueprints or will reverse engineer a sample part for all critical dimensions. Our proven manufacturing techniques (which include waterjet cutting, flash cutting and die cutting) will deliver on-time, on-budget parts that are precision engineered to your exact specifications. Guaranteed. Highly Resistant to Chemicals - capable of withstanding a broad range of chemicals during extended service periods. Easy installation, easy to cut - GYLON® Style 3540 is perfect for warped, scratched, pitted or wavy flanges. GYLON® Style 3500 – (fawn color). PTFE with a silica filler. Industry application: food, power generation, chemical, water and wastewater treatment. Resistent to: water, strong acids (with the exception of hydrofluoric acid), steam, solvents, cryogenics, chlorine and other corrosive applications. GYLON® Style 3504 – (blue color). PTFE with glass microspheres. Industry application: food, power generation, chemical, water and wastewater treatment. Resistent to: refrigerants, water, moderate acids, solvents, cryogenics, hydrocarbons. GYLON® Style 3510 – (off white color). PTFE with barium sulfate filler. Industry applications: oil and gas, petrochemical, pharmaceutical, water treatment, chemical, power generation, medical. Resistent to: steam, gases, chlorine, water, moderate acids, hydrocarbons, chlorine, cryogenics, and strong caustics. GYLON® Style 3540 – Microcellular PTFE. Industry applications: chemical, petrochemical, oil and gas. Resistent to: strong acids, chlorine, hydrocarbons, cryogenics, and strong caustics. GYLON® Style 3565 – PTFE with glass filler. Industry applications: medical, laboratory, power generation, chemical, petrochemical, oil and gas. Resistent to: solvents, moderate acids, cryogenics, hydrocarbons, glass-lined equipment, and moderate caustics. Hennig Gasket offers just in time (JIT) delivery of GYLON® gaskets, along with specials and prototypes being fabricated and shipped on the same day. Our in-stock inventory of GYLON® material includes 1/16” and 1/8” thick sheets, measuring 60” by 60”. Request a quote today!